Thank you for your registration for HER2017 “Enhancing Performance & Productivity in Higher Education”, to be held at Hiroshima University on 26-28 September 2017. You will receive an automatic e-mail confirmation within a couple of minutes. If you do not receive an e-mail confirmation include your spam folder, you may have entered the wrong e-mail address on the registration form. 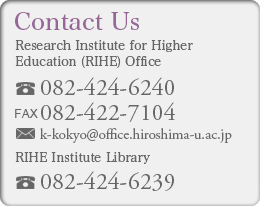 In that case, please contact HER Organising Committee (Iwher2017@hiroshima-u.ac.jp) to confirm your registration and payment transaction; and to ensure that you will be able to receive the message from us letting you know additional/emergency information. We’re glad that you will participate in the workshop, and look forward to meeting you in Hiroshima. Please note that payment of participation fee (including conference dinner fee) can not be refunded in any case.